A planning document for a display at the Orange County Regional History Center in Orlando, Florida. The exhibition, entitled "Pride, Prejudice and Protest", chronicles the history of the Gay, Lesbian, Bisexual, Transgender community, sharing the progress and setbacks of the Central Florida LGBTQ+ community over the past five decades. The planning document is divided into three columns: Text, Theme and Image or Artifact. Original color planning document: GLBT History Museum of Central Florida, Inc., Orlando, Florida. Originally created and published by GLBT History Museum of Central Florida, Inc. Copyright to this resource is held by GLBT History Museum of Central Florida, Inc. and is provided here by RICHES for educational purposes only. O'Conner, Brendan. "New Exhibit Shares Stories of Pride, Prejudice and Protest Over Five Decades." Bungalower, September 21, 2016. Accessed February 26, 2019. https://bungalower.com/2016/09/21/new-exhibit-shares-stories-pride-prejudice-protest-five-decades/. Ruiter, Jason. "GLBT Central Florida history exhibit chronicles victories and losses." Orlando Sentinel, October 9, 2016. Accessed February 26, 2019. https://www.orlandosentinel.com/news/pulse-orlando-nightclub-shooting/os-pulse-gay-history-20161009-story.html. 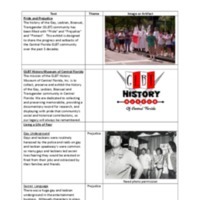 GLBT History Museum of Central Florida, Inc.. “Pride, Prejudice and Protest.” RICHES of Central Florida accessed April 23, 2019, https://richesmi.cah.ucf.edu/omeka/items/show/10555.